Todd Hutchings was not originally Rustam's rival, we already wrote about it in previous articles, but now, if you look at the recent past of these athletes, this pair looks very competitive. Todd Hutchings is an incredible armwrestler, neither more nor less. Todd can also be called one of the most unpredictable athletes. Todd trains in his garage, using homemade means, and from "sports nutrition" uses mostly beer :). If you watched his performances, you might notice that Todd can have problems with fast athletes, he can "sleep" start, and in general long "accelerates", but when he does - he becomes a real dinosaur and the nickname "Toddzilla" very well describes his style. Remember the last A1, Todd had problems in qualifying matches, and he barely got to the finals, along with no chance of losing to Spartak Zoloyev, but in the finals it was the same dinosaur who did not give Spartak a chance. Remember his armfight with Khadzhimurat Zoloev, then Todd showed not only his great strength, but also excellent endurance. It is worth recalling how he easily won Krasimir Kostadinov in armfight, although it was quite a long time ago. In general, in what form and with what attitude will Todd Hutchings fight, only he knows, so we can just wait. Rustam Babaev is a legendary armwrestler without exaggeration. He has so many titles and victories over different top athletes, that he can be considered a favorite with any rival. 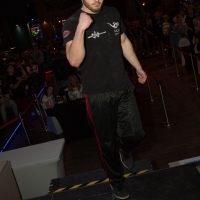 After his return to competitive armwrestling, Rustam added a little in weight and showed that he was not going to swing for a long time and was ready to fight at the highest level. On the previous Zloty Tur in the open weight category, Rustam defeated Gennady Kvikvinia, who at that time was the world champion in heavyweight. After that, Rustam recorded on his account the victory over Khadzhimurat Zoloev and Dmitri Trubin at the tournament in Lotoshino. But Rustam can be defeated, it was shown to us by the same Khadzhimurat Zoloev (Lotoshino) and Krasimir Kostadinov (Zloty Tur-2016). Many problems were also brought to Rustam by Ermes Gasparini. To one fact Rustam has already taught us: if he comes to pull, he is always well-prepared, in excellent shape and set for the maximum result. So, on the one hand we have an outstanding Rustam Babayev, on another 50-year-old Todd "Toddzilla" Hutchings, each of them is sure that he will get the title of the champion. As a fan, I would like to see an equal fight in each round and eventually 3-3, but I think that in this armfight the champion will be determined, and it will be Rustam Babaev.